Says Drew Noyes as he leads old expats up the garden path. Drew Noyes says in this video that he likes the status of married but available ‘MBA, you know’. He recounts the story how sitting in the back of a taxi his first wife Nittaya ‘ whom I love to bits’ saw pictures of US President Bill Clinton with his wife Hilary then Bill Clinton with Monica Lewinsky, who famously provided the President with a sexual service. “Is that his other wife?” she asked”. ‘I was rich at the time and I asked how much is a house? She replied one million baht (at the time US$25,000). ‘So I said to Nittaya. Even though I am a superb father a loving caring father but a really crummy husband when I get out of the house and sometimes I veer. “I thought I can live here. I can work because I can do any business I want. I can have a wife in one household and then another wife in another household and it’s not bigamy, its big of me, but not bigamy. 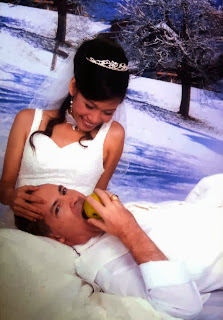 “In Thailand you can register your marriage. “You go to the amphur and you can have only one. 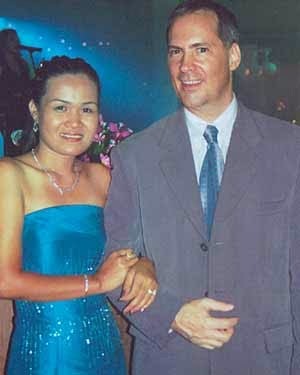 But you can have an insurance policy, you can add your ‘mia’ noi’ (minor wife) ‘mia luang’ (major wife) anyone you want. It’s not that uncommon. So everybody, depending on what it is you are looking for in Thailand, you ought to be able to find it”. “That’s good question,” says Noyes. Then he finally puts in a plug for his business. He’ll send someone to the land office for 8000 baht. And how a punter screwed up by trying to do it himself Then gives a short lesson in Thai. ‘mai, mai, mai, mai, mai, mai….. But what he does not warn punters about is the real costs – He has eight children by three different mothers. He does not buy all his women a house however. A ‘mia noi’ has had to take him to the family court in Chonburi and he has been ordered to pay a fixed fee a month in child support. Oh no – not another bill! A psychoanalyst writes: When a Thai woman says you can have as many wives as you want, she is either lying through her teeth, or has already secured her own future. Drew Noyes is showing all the self-delusional traits of a first time foreigner in Thailand. His audience appears to be mainly of elderly men who have come to Thailand seeking younger woman – I may be wrong, but if so it is something they will have to pay for. If the information provided by the owner of this website is true then Drew Noyes will have followed the path many foreigners have already done in Thailand. Most of his property appears to be in his common-law-wife’s name. However it may be that he is not living with his common-law wife but a girl from a bar. That house may also be in the name of the woman he refers to as his ‘common law wife’. If he has asked his wife to sign loan agreements for the properties he has put in her name, these agreements are probably not enforceable. Moreover added to his problems if, as it is stated, he has put down cash on 30 condos in the Lumpiniville complex in Pattaya – and has not been able to sell them on at his higher asking price – this may be another rock around his next. His former newspaper I am informed stated that there was a property boom in Pattaya. This indeed may not be the case, despite his efforts to convince foreigners this was so. His common-law wife may say ‘enough is enough’ she is now embroiled together with him in two court cases, one for blackmail and one for fraud. While the evidence appears to show she may have been fully involved in these conspiracies the court may take the view that she was an unwilling participant, working under her ‘husband’s’ orders – even though he is not the husband, but the father of her three children. He has however , it would appear. lived up to his fantasy that he now has a ‘wife’ with three children in one house, an ex-wife in another, a minor wife with four children ( the ex-wife’s, not hers) in another house, and a former minor wife with another child in a fourth house for whom a court has awarded child support. The reality of the situation can be quite tragic for all and the costs are high. While he has taken his children to one court case apparently to show he is a real man, he is clearly trying to tell the court he is also a dedicated father. This he may be, but he should perhaps agree to accept a counselling. But he may well have a disorder that does not allow him to see what he had done wrong – He will think he is right and everyone else is not only wrong but inferior. He believes he is a member of the Foreign Correspondents Club of Thailand and a friend of the Ministry of Foreign Affairs and the Public Relations Department of Thailand and the Crime Suppression Division. This might indicate that he is unable to read bad news, or news that is bad for him. There may be no cure. February 24, 2008 Andrew Comments Off on Why Won't The Foreign Office Help?